So, Monster Hunter 4 is a bit popular in Japan. We recently reported Capcom's announcement that over two million copies had been shipped in four days, with download purchases also lifting it to third in the all-time 3DS eShop regional chart at that point. If anyone was concerned that a 'shipped' figure wouldn't amount to equivalent sales, today's Media Create charts put that concern to bed. The latest results show Capcom's behemoth at number one with an incredible 1,715,060 sales, all in just two days — 14-15th September. That only includes physical retail sales over those two days, too, so eShop downloads won't all be featured aside from those sold as download cards by retailers. The top 20 is below, with lifetime sales in parenthesis. This huge 3DS exclusive also brought on a significant surge in 3DS hardware sales, with the XL model benefiting the most. The combined SKU sales of 276,000 are impressive, especially considering the fact that the 3DS has consistently been the top-selling hardware in Japan for well over a year. The Wii U is still toiling as it awaits major releases in the coming weeks and months; the results are below, with last week's sales in parenthesis. We normally close by saying that it's been another good week for the 3DS in Japan, but this week has been a monstrous success. Awful word choice aside, it's safe to say that Monster Hunter 4 is well on its way to smashing Capcom's sales projections of 2.8 million units by 31st March 2014; that can only be a positive for future chances of more MH exclusives and, here's hoping, localisation. I'm imagining Uta no Prince-sama: Music 2 as a game about the singer Prince. I don't want to Google it and shatter my illusion. The Japanese like their handheld games, no joke. Are there any official Pokemon X+Y prediction numbers for Japan, and did they just go down b/c everybody will still be busy playing MH4? Just crazy numbers, the WiiU could use some Monster Hunter ASAP. At this rate, it's gonna pass Mario Kart 7 by weeks end. No wonder Nintendo don't seem too bothered by Wii U's mediocrity. I'll just say that if the next Monster Hunter is on WiiU we've got nothing to worry about. @galetyler You're right. This was a PSP exclusive game. Whatever happened to that? I recall the creator saying that the 3D in the 3DS was reason enough to put the third installment on the Nintendo handheld. But wonder if there's more to the story? Because if I'm Sony, I would do everything to not let this exclusive game be on other systems because, well, just look at the numbers! Extraordinary! Hey, erm, is Nintendo still "doooomed?" Seriously tho', I'm glad for Capcom. It makes me sad seeing the Vita struggle as it really is a great system. @idork99 They had a falling out with Capcom I believe and Nintendo came in and bought the exclusive rights to Monster Hunter until at least 2015 and with the success it has seen on the 3DS and Wii / Wii U I can see Capcom sticking with Nintendo for this franchise. @DiSTANToblivion The Vita's problem is that it offers "home console experiences" but I have my PS3 / Wii U for that, I want my handheld to offer me different, unique experiences not cross buy or PS3 games that get ported to it. The Vita to this day lacks a "killer app" unless you enjoy FPS's in which case Killzone is one title but that's it... it needs more than that and the only people to blame are Sony they tried to make a portable home console and failed miserably. Where as Nintendo knew that people who play handheld games are looking for games which can be played in short segments of 20 - 30 minutes while on a bus or a train which is what titles like 3D Land, Mario Kart 7, Fire Emblem Awakening and Kid Icarus offer. Japan REALLY prefers the XL version over the original it seems. They are quite literally insane figures! Looking forward to seeing if Pokemon matches it (or beats it?). Is the 2DS coming out in Japan? @FarukoSH - "Around 2-2.5m first week"
So, if Nintendo did decide to get out of the home console market, nobody could really blame them? 1. vs. 2. --> Ouch..
3DSs vs. VITAs -->Very, very Ouch! If there's a lesson to be learnt here it's: don't release your game in the same week as Monster Hunter. If only the west could reach half of those totals. It really is a good series! I hope for a release in the west within 6 months time please Capcom! @Jahir As a huge 3rd party exclusive, it would be crazy not to bring it to the Wii U. Infact the reason why I caved in and bought a Wii U in the first place was for MH. Wow, those are some great numbers for the title and 3DS. I would buy this game on launch day if it's localized for Wii U.
Localisation can't come soon enough, the sales are great and the reviews are also looking good. I said the estimate of 2.8 million in 6 months was low, and people criticised me! 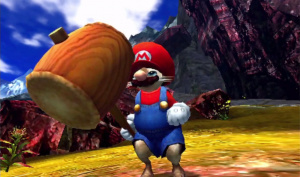 Monster Hunter 3 sold 2 million, and that was a port of a game they'd had for years, during the 3DS's poor period. This was always going to destroy those figures as its brand new and there's way more consoles out there now. @galetyler You do make some really good points, it's unfortunate that they didn't try and seperate console and handheld. There are a few great titles though, like P4G which is especially great if you've never had the chance to play Persona. Soul Sacrifice is pretty under rated to me but again just feels like a console game. Dragon's Crown should've been a Vita exclusive. Tearaway looks awesome and very original, that could show some unique features of the Vita for sure. Safe to say Capcom are rubbing tier hands together like some Bond Villian. That's impressive. I'm very curious to see if the upcoming Pokémon release can surpass this. @galetyler While it's a poor decision to pretty much make it a portable home console-like experience, I don't see why a handheld has to have exclusively 'handheld' titles. If they need to stay separate then what is the point in the Wii U getting GBA titles over the 3DS? Believe it or not, there are people who aren't always home but still may find themselves with some free time on their hands for any type of game. I'm glad to see it doing so well. I wonder how good the eShop sales were. Let's all have a MonHon party! ....What do you mean you bought a Vita?! Hopefully this will see localization, now. It might make up for the lack of SE's Dragon Quest VII, DQM: Terry's Wonderland and Slime Mori Mori 3 outside of Japan. come to US. please, please, please please come to US. Make a G rank MH4 and you got a deal. I always prefer that version. Might also give them time to work on the game. Western localization please! 3DS is on fire! And it'll take weeks before it cools off! Now I'm anxiously waiting for these numbers for Wii U. And now they have to bring it to western regions! @Miiamoto To play the brilliant Ragnarok Odyssey for only 15,- and with beautiful graphics. I wonder if Pokemon X & Y will be able to match or surpass those sales on launch. @cookiex Not sure if you've noticed, but Nintendo seems to prefer it, as well. Most videos you see with game footage are shown on an XL system. Also, there's the whole thing with Japan getting two special Monster Hunter LL systems, so that may have had an effect on the humongous sales of the LL. Also, it really is just better. It seems that the Vita is getting Monster Hunter Frontier G, which is also coming to PS3 and Wii U. That's a really old version of MH though, so it probably won't do much for the Vita. Ok Capcom, the 3DS version sold extremely well, now it's time to focus on bringing it to the Wii U!!!!! To put it in perspective it has been out for 6 years on both PC and 360 and has sold less than 200,000 copies. I think it should be an interesting battle between the two. I think you're being way too optimistic with Wind Waker however. There isn't even 5 million Wii Us out there in total, across the whole world, and even at it's best Wind Waker is only going to sell to a fraction of those owners. There's no chance whatsoever Wind Waker will come anywhere near selling the numbers you think in it's first week. It will be lucky if it hits 4.5-5 million in it's lifetime. @Chriiis It is ok if the portable and the home system are exactly the same. Turbo Express / Sega Nomad were much better than the competition at the time Nintendo just had better marketing. I would get a Wii U if I could get one with the whole thing built into the gamepad and no drive. Portable enough.